DO NOT USE THIS FILE WHEN YOU ARE USING D2SE TO AVOID CRASHES! I think this occured because I installed it over the last beta and the old shared stash had a item that was altered or removed. Updated to 4.1 - Please download the files and put it in your 4.0 folder to apply this patch! Updated to 4.2 - Please download the files and put it in your 4.0 folder to apply this patch! I played throw barb before major nerf. Most of the on striking procs were not working. For example ctc teeth from amulet, ctc fire sphere from weapon runeword, ect. Now i play druid - seems like CB from beast mastery is not added to total CB. Stat screen only shows CB i got from weapon. Also splash damage on 2h weapons. How does that work ? I have poleaxe with splash damage on it - seems like all my hits just hit initial target and nothing more. When i was using 1h weapon at start in act1 i could actually see the other mobs around taking damage. My first thought was - i am 1shoting mobs so this splash damage is not active. But i got surounded on purpose with many mobs - still damage goes on 1 target. Tomahawk Rain convert the Physical Damage, thats why it can't trigger on strike effects, which is intended. Crushing Blow is added to the beast, thats why i you can't see it in the character information. Everything in your character information screen isn't passed to your minions.. like everywhere else. 1-Hand Weapons have no melee range, thats why u see it in a very small radius. 2-Hand Weapons do have a melee range, could be possible that the splash is applied after the range. Besides of that there is no difference on how the splash damage is applied to the weapon. Updated to 4.3 - Please download the files and put it in your 4.0 folder to apply this patch! Well there is something wrong with splash damage with the weapon i use. Clearly mobs around me, around my initial target - none of them is taking damage. I will try to make video as soon as possible to show how it works. Also note about splash damage - it is affix on all 2h scythes, but not on sander set scythe or unique scythes ? Any particular reason for this ? I listed it for myself to add it on set weapons, on unique weapons it should be already there - maybe i forgot to add it on some, will fix this for the next version. And the splash damage should work like said. Im pretty sure it have something to do with the weapon range. The only way to fix this, would be to increase the radius of splash damage, which would make splash damage why to strong. Agreed about to not increase range. Eastern sun has this mod via jewels with % splash damage. When you get 100% - every melee build with strong weapon becomes insane good. Few reasons that i guess for current splash not working for me - druid morph, low atack rating (around 80% current), killing initial target in first swing, not working on poleaxe specificaly, additional rw in weapon, weapon range is too long and does not make splash proc work. No need for video, i just tested a few things and found a something. Tried unique polearms - Partizan and Grim's burning dead. Both have splash damage - both splashes do not work with or without bear morph. Tried same stuff with rare poleaxe class weapons + spears + mauls + scythes - all rares with splash damage work and do splash damage. So it's a thing with unique polearm class (or maybe with all unique 2h weapons - don't have other ones to test) and no clue why. May join our Discord, i have u have questions about stuff like that. I'd rather avoid discord and similar chats. Just personal reference. 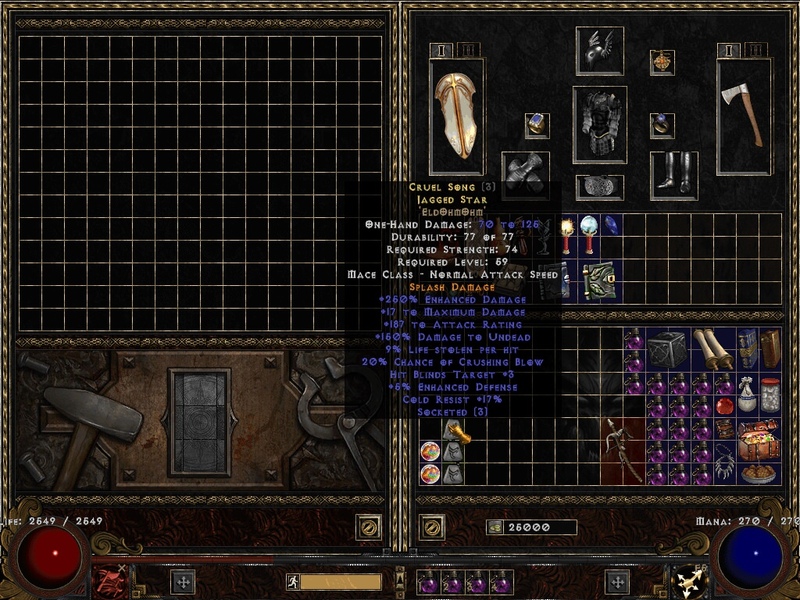 Feedback on throw barb via tamohawk - it got a little better, but still not viable build. Here is why - i have 35k atack rating - 95% to hit most of the stuff in game. When i am killing mobs that move around - it's ok, axes are spreading and target gets hit. When i fight static stuff like Mephisto or dragonspawner house - i kill stuff around them but not the target. Sounds weird but i kill mobs around dragonspawner when they pop out but house it's self is taking damage only from merc and pet. Honestly i would agree with even 1 missile instead of 10 if it would hit target with 95% chance. Now i just throw 10 axes (25 mana per throw) and get random results. Not sure what is the problem but my user on RoS server seems to be stuck. Can log in, can select char, cannot make any games on any difficulty. When making new game it says "please wait" and nothing else is happening. This started today in the evening, was playing in the afternoon with no issues. Server crashed. should work again. Yes, it works again. Thank you for quick solution.